A new reg to me, could be good if stored in the dry? but suspect a lot of rubbers perished. Earths probably corroded all over, as wont start. Re: Not seen before ? Titian Red (076) if I remember correctly. I did think the ebay one was Juzz Black's old one (D25 XOY). Wonder what happened to that after Snakebite sold it. 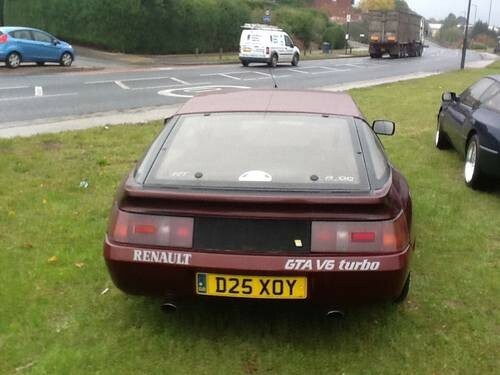 Are those round exhausts and v6 gt on the rear Windows from an atmo yet a turbo dash? Windows and exhaust look correct for a turbo. Seems to have sold already!! Could be a good buy if not rotten underneath. Rear tailgate hinge appears to have rusted away and broken at the roof. I have just bought the car you are referring to. Firstly the web site wont accept my two email address so i have had to use my wifes. I'll see if i cant change it back to one of mine. Being new to these cars i would appreicate a little help and advice. I am not new to restoring other cars, i had a De Tomas Pantera for 16 years and have just completed a light restoration on a tired Murcielago. I went to see the car yesterday and goodness it has 25 years of dirt on it. The only things i can see under the dirt is the engine cover as you pointed out has a damaged hinge and the front cover see to be of a similar position. The exterior passenger door lock is also broken. Are these difficult repairs and or is a replacement lock available. The doors have not dropped and from what we can see the chassis looks OK, but we will know more in a couple of weeks when we get it home and under a ramp. Oh only one key with the car so not sure if it will lock, The car is totally dead, the owner said it did turnover but would not fire up. I may have bought a lemon but it might also turn onto a very nice car once fully restored. There is reasonable spares coverage but you have to know where to look. Fortunately this is the right place to start. It would help to know where you (and the car) will be as there are specialists in different parts of the country...and they will also be the best source of spares and advice. This is a helpful club and people will do a long way to help you out. One problem is there are a lot of cars needing work and only a small number of specialists, but if your car is really just dirty, then a Renault specialist of the right age will be able to get it running again. But anything alpine specific might be best left to one of the known specialists. Brake parts can be rebuilt or are available, but your car has some model specific engine components that are getting scarce, recommission it carefully. Gaskets are simple, blocks and oil pumps aren't. Lots of the shared parts come from rare cars too. The parts book and the official workshop manual (English version) are available to club members as a PDFs. Much of the running gear is shared with other cars but not always very clearly as alpine used to change part numbers to confuse. Easiest place to get parts is Simon Auto in Germany, if only because he has a a good on line catalogue, simple payment and very reliable and quick delivery. Stephen Dell (Club founder) has a parts stash near oxford...arrange to meet him there to get what you want quickly. Keys can be easily cut, there is no complex immobiliser, do you have the remote plipper too? Door locks are probably cleanable and solenoids and motors are not too hard to rebuild. My GTA hasn't run since the mid 90s and the door locks need a good clean, but are otherwise OK. I wasn't so lucky with the underside, but its all fixed now. I hope to have it on the road in the next month (but I've been saying that for a while...). The light units are scarce but your look good. Whats really surprising is how often you get positive responses from other motorists when out in one of these...they still turn heads and values seem to be on the way up. Thanks for the reply and guidance. I am currently looking at Simon's web site and will surely get I'm touch with Stephen. I am based in Durham, I recently spoke to a company in Newcastle who advertise that they maintain these cars but told me theyhad not seen one for a few years? Just to clarify the passenger door exterior door lock is actually broken. I assume someone has been a bit too hasty in trying to open the passenger door, so it will defo need a new one. I only have one key and no remote plipper. Do you know where you get keys cut? If the chassis is in a poor state and I hope not are these generally repairable? Looking forward to a long and exciting restoration. Door locks..try bigmvs on here...he’s in Sandbach and has broken a few rotten ones. He’s on eBay as hertzvanhire. Stephen will probably be able to help you too and Simon Auto have lots of stuff that they don’t list...if you call them or email them (slightly less reliable) they can help. They speak excellent English so no need to feel intimidated about calling. Both cars my have gone to RATS in Heanor for work...he’s quite busy so you may need to wait a bit, but give him a call, he has a friendly body shop next door that have done lots of rust work on GTAs and 610 if it comes to that, but if it’s been in the dry, you could be lucky. Put it on a ramp look, at sills, jacking points and thier outriggers, front of floor to cross member, the cross member itself, all the suspension turrets and the wheel arch pockets...these are rectangular openings in the top of the wheelarch...plus of course the sub frames front and rear. It’s all quite easy to see except the cross member. But its all repairable (but not free to fix). Gta turbo has two fuel pumps so that sometimes catches people out when trying to work out why nothings working.If it’s completely dead...then again it’s probabaly something simple like corroded earths or a stuck relay. Keys are standard Renault fare from the age..my local key cutter had blanks last time I needed one, might be a mit harder now, but eBay could be your friend. Amazingly new plippers and receivers are still available from Renault, I got one last year, but they are less helpful on keys. John c in jersey is very helpful at getting anything electrical fixed. Don’t worry...it can be got going, if the paint is good or ok and it’s complete, that’s a great start. Hi once you get it going it will be interesting to hear what you think between the driving experience of the Gta and a pantera, one of my favourite cars obviously not the engine sound. Welcome to the world of Alpines.